The best summer destinations are ones that offer a wide range of activities for the whole family to choose from. 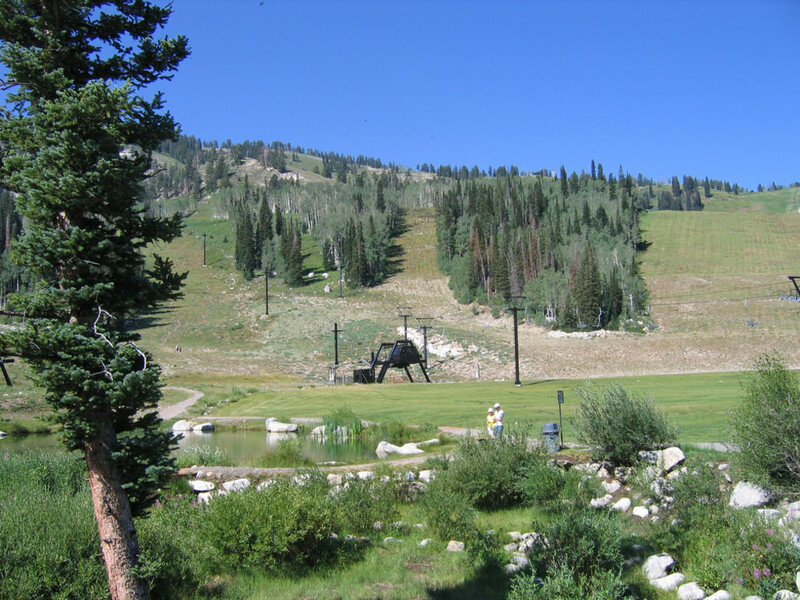 Summers at Utah ski resorts fit the bill by offering all kinds of outdoor fun (except for skiing). 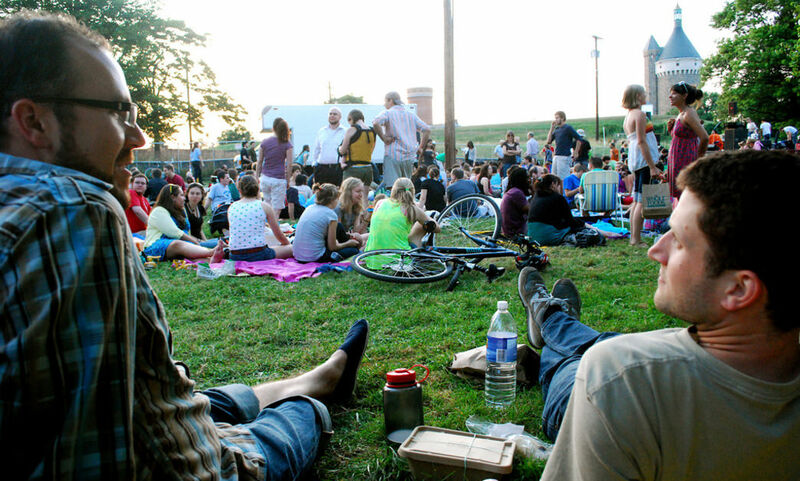 You can find festivals, hiking, sports and all other kind of outdoor entertainment options for the whole family. Whatever you choose to do this summer, Insect Shield has your entire family covered. Learn more here. It can be hard to remember exactly what winter looked like when you’re hiking along a grassy hillside blanketed by quivering wildflowers, taking a deep breath of cool air, looking down at the chairlifts halted in a summer standstill. But more and more ski resorts are realizing that summer in the mountains is nearly as nice as winter, and they’re giving people more reasons to get out of the valley. Some resorts, like Alta and Brighton, keep things fairly chill through the summer months. Hikers amble around on the summer trails through the aspens, taking photos of moose drinking from streams. Their lodges host the occasional wedding party, which is about as loud as these resorts get in the summer. Other resorts, like Snowbird and Park City, go all in with their offering structured summer activities. And while we love a quiet hike through Alta’s Albion Basin, zip lines, mountain roller coasters, and alpine slides are pretty darn fun, especially when paired with alpine beer and upscale dining you don’t have to dress up for. So, while ski bums mourn the end of winter, adventurers can find plenty of fun at Utah ski resorts in summer. Here are a few of our favorite options. go ahead and make the most of our resorts in the summer and salivate over the slopes you’ll hit in ski season. The Canyons resort hosts concerts all summer long (photo of a different location). The Canyons is a resort that knows how to party down, summer or winter. And all summer long, the resort hosts a free concert series that attendees are welcome to bring their own picnic baskets to. The stage is set up on a grassy hillside at the resort’s base area, and every Saturday evening, families, singletons, couples, and salty old mountain folks all groove together. The resort books a wide assortment of bands and music types, but few people care who’s playing, because a good time is pretty much guaranteed. The Canyons is also well known for its excellent cross-country mountain bike trail system and a challenging downhill-specific bike course with tons of terrain features. The resort also added a mountain disc golf course and kid-friendly mini-golf course to its repertoire. Throw in a fancy dinner at The Farm afterward if you feel like a superb cheese plate is the only thing missing in your day. The Park City alpine coaster is the best way to cruise to lunch. Rides are for kids, right? Wrong. Well, they’re great for kids. 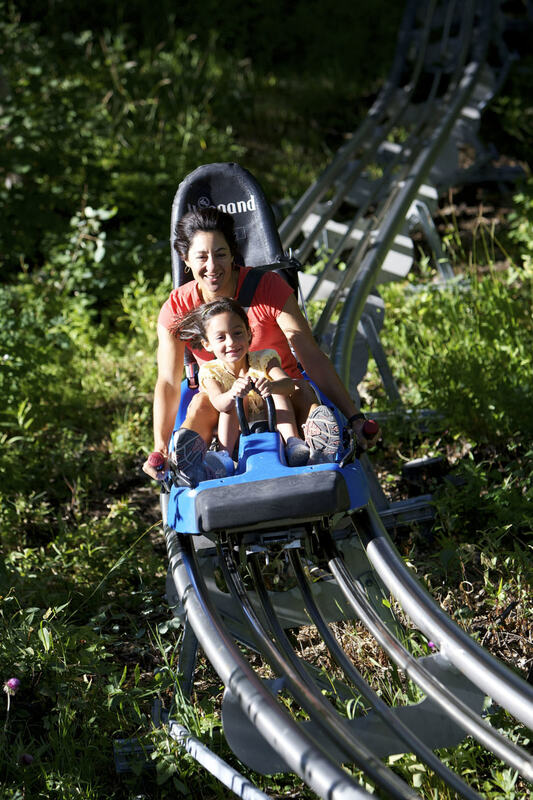 But the alpine roller coaster and alpine slide at Park City ’s summer base area are uber fun, even if you’re an adult who hasn’t even been drinking. For a few bucks, you can ride a chair lift to the top, then slide down 3,000 feet on the alpine slide (actually via a sled-type contraption with wheels). It winds around the mountain like a waterslide, and you control how fast or slow you go. The alpine coaster is slightly different: You sit in a seat on a roller coaster track that hovers several feet off the ground over its mile-long course down to the bottom of the mountain. Since you’re attached to the metal rails and won’t fly off, you can go faster than you could go on the alpine slide. And flying through the open meadows and tree groves on Park City’s slopes is just about the best way to take in the fresh mountain air. Cap off your adventure with whiskey and food pairings at High West Distillery for a lovely summer day. 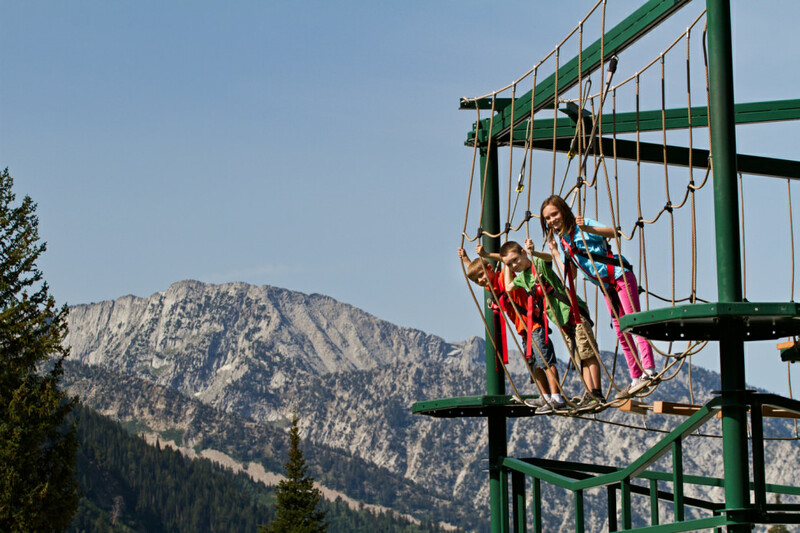 At the Snowbird ropes course, there’s no surcharge for the view. Snowbird is a veritable mountain mini-city compared to most of Utah’s resorts, and they make good use of their space in the summer. Not only do they have tons of lodging that’s discounted in the warmer months, but they also have just about every on-mountain activity imaginable, plus most of the restaurants are open. You can mountain bike on their downhill course, hit up the alpine slides (smaller than Park City’s but still very fun), catch a ride on the zip line, try the rope course, let the kids harness up for the trampoline, or see a free Saturday evening concert. On Friday nights, they even project movies onto a large outdoor screen on the Plaza Deck. (Bring a thick blanket—the evening temps plummet.) And in late August, Snowbird’s famed Oktoberfest kicks off, offering beer, music, and traditional German food through mid-October. At the end of the day, Salt Lake locals can pony up a few bucks for access to the Cliff Spa, a grownups-only rooftop pool and hot tub. You can soak in the canyon sunset in relative peace and quiet. Disc golf is a popular summer pastime at Solitude. Summers at Solitude are very un-fussy. The resort village goes quiet, most of the restaurants are closed, and you just see the occasional hiker or mountain biker coming through. But the disc golf? That’s another story. The resort’s mountain disc golf course is the stuff of legend among pro disc golfers and is just as fun for newbies. You can rent discs and get a scorecard in the village and purchase a one-ride lift ticket to the top of the Sunrise lift. From there, a full 18-hole course winds down the mountain. The rules are just like golf: You tee off and count how many throws it takes you to get to the basket. (Each “hole” here is a par three.) People inevitably end up climbing trees and crawling through bushes in pursuit of wayward discs, so bring a couple extras in case one ends up getting donated to the mountain gods. If you have kids in tow, think about renting an overnight condo in the village for access to the swimming pool. And if its adults only, consider a dinner at St. Bernard’s while you’re up there. It’s about as nice as summer mountain dining can get.